The demand for serviced offices in the U.S. alone is expected to increase greatly between 2015 and 2020, with more and more workers telecommuting. However, organizations still need a place to meet with clients; serviced offices provide the perfect solution to the dilemma that many organizations without a central location face. It may surprise many business owners that everyone from major corporations right down to start-ups rents space, even in major business epicentres; for example, in the Greater Toronto Area, a serviced office in Mississauga is a popular option. These types of offices are most popular with professionals in scientific and technical industries and the demand has seen a steady increase since the recession ended, as more and more organizations are starting to feel more at ease with spending. Why Has There Been an Increased Demand? 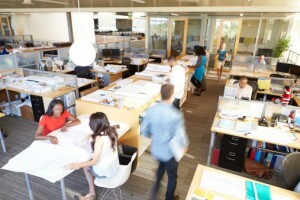 As the economy has recovered, consumers feel more comfortable about spending, causing organizations, regardless of their industry, to explore new options for renting office space. Serviced offices have rapidly become one of the go-to solutions for many of these businesses leading to increased competition in the industry. It’s no longer just startups and entrepreneurs who are using serviced offices as part of their regular business practices. Countries in the U.K., for example, have seen a rising number of well-established businesses migrate away from the traditional office form and navigate toward the allure and convenience of serviced offices. Many North American-based companies are taking notice of this trend and following suit for a few very good reasons. Serviced offices are slowly ceasing to be an anomaly in parts of the GTA, such as Mississauga, and are now becoming normal business solutions. As small to medium-sized enterprises (SMEs) continue to grow and expand their horizons, it’s absolutely imperative for their working environments to keep up with the growing demands of these businesses. With constant industry-based technological advances being made, it’s almost impossible for modern-day businesses to maintain their finances and update their required equipment on a regular basis. Software becomes outdated, computers need to be replaced every couple of years or so, Wi-Fi Internet is an absolute necessity for every successful business. All of these are amenities that are included in flexible serviced office payment plans that businesses might not otherwise be able to afford as they hire more staff. On that note, an increasing number of office employees are also requesting to work remotely either from home or other locations due to the fact that commuting is no longer as convenient or affordable as it once was. Given the fact that most people can work from home on their laptops and submit their work via e-mail (provided they have a reliable Internet connection), there’s no reason why this should be an issue. Working remotely has been proven to improve the quality of life and overall happiness of most employees as it allows them more freedom throughout the day and alleviates a great deal of pressure and distractions that exist in traditional offices spaces. Lease terms in serviced offices are on the whole much more flexible and affordable than paying for a traditional office space. Most serviced office leases only last anywhere from six to 12 months and you don’t usually have to pay first and last month’s rent. You pay on a monthly basis for whatever facilities you use within the office rather than paying a lump sum for more office space than you actually need. Serviced office spaces are usually move-in ready unless otherwise specified, meaning they’re fully furnished and pre-decorated. In some cases, you might even have the option of completely changing or slightly altering the décor to your liking. Some serviced offices might even allow you to add your company’s logo and branding throughout the office on days when you have client meetings or are holding interviews with prospective employees. Between 2015 and 2020, more workers will start to work from home, but organizations will still need brick-and-mortar locations to meet with clients and hold training and education sessions, among other things. In addition, rent is steadily increasing and may soon be out of the reach of even a successful organization. If you’re in the GTA, consider a serviced office in Mississauga as an affordable alternative. However, providers of serviced offices have greatly increased in recent years, making choosing the right one for your organization difficult. That’s where Innovative Professional Offices comes in. We provide our clients with fully furnished and equipped single, shared, or virtual office spaces. Our full range of administrative services includes telephone answering, call forwarding, printing, faxing, IT support, and more. We also offer fully-equipped boardrooms and provide you with an address for your business, adding a sense of legitimacy to home-based companies. “Serviced Office Leasing in the US Industry Market Research Report from IBISWorld Has Been Updated,” PressReleaseRocket.net, January 23, 2015; http://www.pressreleaserocket.net/serviced-office-leasing-in-the-us-industry-market-research-report-from-ibisworld-has-been-updated/48681/.